Will college acceptance rates hit record-breaking lows? Let’s take a look what you need to know as the parent of an aspiring applicant. Most colleges with Early Action and Priority admissions, including the University of Maryland, the University of Richmond, UVA and UNC Chapel Hill, have informed candidates of their decisions. Maryland, which claims it examines 26 review factors when assessing candidates, offered some students spring admission, a way of managing student volume. Those admitted under this plan cannot appeal, nor can they wait until the following fall to enroll. Sometimes, Terrapins don’t appear until spring. Meanwhile, the University of Virginia reported a 17 percent increase in application volume, with 71 percent of those apps from out-of-state students. Of that amount, UVA took just 19 percent. Just when you thought the applications were over, colleges are changing their deadlines. As reported in the WSJ, “Delayed deadlines are a sign of the growing pressure many schools face to fill their incoming classes.” As a result, popular colleges including UChicago, GW, Oberlin, Fordham and WashU have extended their deadlines. 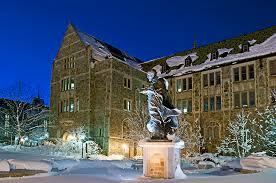 Many students hoped to secure a spot at Boston College in December but were deferred to the Regular round. In an interesting turn of events, BC last week announced that effective with the next application cycle, it will scrap Early Action in favor of two rounds of Early Decision. That will help stop the guessing on both sides. Social Media: Who’s Looking and Why? The Journal tells readers: “Schools use this [marketing] information to help determine what they call ‘demonstrated interest,’ or how much consideration an applicant is giving their school. Demonstrated interest is becoming increasingly important as colleges face a rising number of applications and want to protect or improve their yields—the percentage of accepted applicants who enroll.” They mention that colleges including Dickinson, Quinnipiac and American acknowledge tracking activities such as clicks and visits. There are many ways to demonstrate interest outside of what is discussed in the article. The reality? Some colleges care a whole lot more than others, depending on how much they need to compete for students. Here’s an important lesson for applicants mentioned in from the article: responding to a request for an interview. 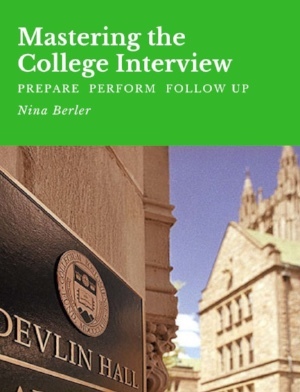 According to Quinnipiac University, “If we ask someone for an interview, we look at how they respond, how quickly they respond or if they don’t respond at all. It helps us make a decision.” During admissions season, students should check their portals and look out for requests for interviews. Merit Aid: In Your Student’s Future? Need-based aid is awarded by a college’s financial aid office after review of required documents: the FAFSA and often the CSS/Profile, administered by your friends at College Board. Merit aid is awarded without consideration of financial need. Many elite colleges meet full financial aid but do not award merit aid, but that’s not always the case. Duke University, for example, considers applicants for a variety of special scholarships. A WSJ article last year, “Prizes for Everyone: How Colleges Use Scholarships to Lure Students,” mentioned that 39 percent of students accepted to Tulane received offers of merit aid, with the university spending $71.5 million on merit awards. If your student is so inclined, he may research smaller scholarships by using other sources, from the very reliable Fastweb and Cappex to the newer upstarts Raise.Me and Go Merry. It’s Super Bowl weekend. Pats fans boast that Tom Brady is the Greatest of All Time (GOAT). Brady came to the Patriots from the University of Michigan, which has about the most active alumni network around. Michigan has an Early Action program that allows students applying by November 1st to receive a decision in December. Meanwhile, Jared Goff, the young QB of the Rams, attended UC Berkeley, better known as Cal. Along with UCLA, Cal is the high end of the UC system, with admissions for an out-of-state student extraordinarily difficult. By the way, whose mascot is a goat? That would be the U.S. 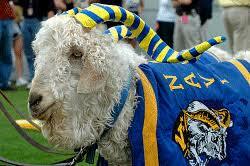 Naval Academy, cheered on by Bill the Goat. On these cold days, I continue to enjoy winter meetings with parents of sophomores and juniors. Schedule something soon if you have questions.